Orientation and Welcome Dinner Participants will be greeted at the 3 Rivers Eco Lodge and taken to their accommodations for their stay. This first day is an ideal time to settle in, meet other program participants, and welcome the journey ahead. 2 6-January-2008 Orientation, tour of 3 Rivers and environment. Participants will visit the 3 Rivers Estate waterfalls. This incredible waterfall can be reached following a simple half-hour walk from 3 Rivers. The trail is both beautiful and easy with a well-made trail and some river walking. You can bathe under this 100-foot-high cold shower and hear your voice echo all around. The water drops close to a massive tree which forms a junction between 3 Rivers, unlike anything else you''''ve seen. 3 Rivers tells only their guests how to find this little gem. 3 7-January-2008 Visit Project Site - Volunteering Participants will visit the volunteering site with a project coordinator who will be your guide throughout your time in Dominica. Project coordinators are knowledgeable and experienced in both development work and Dominican culture. You will spend the day working on an organic herb farm in Grand Fond, the local village, and continue the process of establishing an organic educational garden at the village primary school. The produce from the garden will be sold in the village providing critical funding and education for the school as well as an eco-friendly sustainable life-style for the community. In Dominica, pesticide use is widespread in agricultural production, and about half of the labor force works in agriculture. It is extremely important to educate the youth, and consequently their families and the larger community about organic farming techniques and how to raise healthy and culturally appropriate food without dependence on harmful chemicals. The garden will teach children about traditional Dominican organic farming practices including planting by the phases of the moon, pest prevention using combination planting, herbal and all natural defenses, and composting. Upon completion of the setup of the garden grounds, and before the beginning of the new school year, 3 Rivers Eco Lodge will partly sponsor a community gathering where villagers can come see the garden, learn about the mission, have the opportunity to get involved, and enjoy food and drinks prepared from our own organic gardens. Although there is only one hotel in the area at the moment, 3 Rivers Eco Lodge, there are two more under construction, and the owners/developers have expressed interest in supporting the project by buying organic food if it is available. The aim is that during the meeting, the locals will get the opportunity to meet with the hoteliers, and understand the demand for more organic food in the area, and that there is a ready made market for such organic produce. Who and what does it benefit? This project has many benefits; a garden will provide vegetables to be sold at a farm stand which will provide critical support for the school. Currently the school does not receive any money from the government. It mainly relies on a small tuition fee from parents (who often struggle to pay for several children), donations from tourists, and fundraising. This project provides benefits for the children in the form of increased knowledge and experience. It benefits the school by providing desperately needed funding. It also benefits the community of Grand Frond as a whole by providing an outlet for making more connections between the locals and the fledgling eco-tourism industry in this area. The project will also benefit 3 Rivers Eco Lodge by strengthening our relationship with the local community, and furthering the mission of our Sustainable Living Initiative work. 3 Rivers currently runs an organic herb farm tour with the local ''''herbal expert'''', close to the school. Mr. George, the Herb man, is getting old, and finding it harder and harder to maintain his herb farm, which is close to the school. It is also hoped that some of the children who become interested in the project, will be able to help maintain the nearby herb farm, which brings an income from the local tourists for the village. Mr. George is happy to share the income with those who give him proper help on the farm. 4 8-January-2008 Volunteering Continue working in village with Mr. George and the schoolchildren, with a break late morning to hike to local waterfall, Grand Fond Dernière Falls. Includes packed lunch. Continue garden work in the afternoon. An hour walk from 3 Rivers, up and down windy mountain trails, passing through the village of Grand fond, brings you to a beautiful little waterfall in a rock covered canopy cave, with a cathedral-like shelter of trees overhead. Quiet and cool, this amazing sight is not on most Dominica maps. Well earned rest : Roseau Valley Tour – Hot springs, sulphur mudbaths, waterfalls, and a cool lake. Depending on group preference, we will travel to a lake described below or one of the rustic beaches of beautiful Dominica. Two-and-a-half miles from the village of Laudat, high in the Morne Trois Pitons National Park, this lake is the source of the Roseau River and forms the basis for Dominica''''s hydro-electric scheme. The Lake was originally of volcanic origin but construction of a dam some years ago as part of the hydo-electric scheme increased the size of the lake. Lennox Honychurch writes: Subject of myths and legends....a single-eyed monster was said to reside there...it was also said to be bottomless although it is actually only 55ft deep... If you visit on a grey, misty day when wind-swept vapours swirl across its dragon-green surface, you will forgive the story-tellers for creating their far-fetched legends. The Lake is reached on a new 2.5 mile road from the main Laudat-Roseau road just before you enter the village. In 2005 came the introduction of kayaking and boat tours on the Lake. Besides the Lake itself, there is a good hour-long trail around the lake. You can also continue on the road to the Boeri Lake. Click here for more information about Dominica''''s fresh water lakes. It is about a 15 minute hike to Trafalgar Falls, which includes scrambling and sometimes hugging large, wet, and slippery boulders. The smaller of the two falls is known as the Mother Falls. The larger fall, known as Father Falls has a deep plunge pool. The waters are cool and the pool sufficiently deep that local guides will dive from the ledges above. Hidden in a beautiful little valley in the heights of Wotten Waven is ""Ti Kwen Glo Cho", an organic farm blessed with incredible amounts of amazing hot sulphur spring water and cool fresh water spring and waterfall. Not only does it have its own hot springs and waterfall, but the owner, a young Dominican entrepeneur, has used local bamboo to pipe the hot sulphur water directly into some cool little hot-tubs. Get in, relax, and feel the stress disappear up into the clean fresh air. He also has a small sulphur mudbath bubbling away in one corner of the land perfect for some good dirty fun, and a spectacular waterfall right on property. Homestay Night – The local Dominican families have asked to be in the programme, and stays are normally limited to one night in order not to disrupt family / village life. The goal of the 3 Rivers Eco Lodge Homestay Programme is to offer guests the opportunity to experience true Dominican life through the eyes of its community residents. The programme focuses on interaction between host and guest as a way to enhance and exchange cultural knowledge and understanding. Keep in mind that host families are not professionally trained in the hotel/service/tourism industry and have been encouraged to avoid altering their lifestyles to suit guests. Instead, Homestay families seek to involve guests in their everyday lives, interactions and activities (e.g. church, gardening, drinking etc.). Remember, the idea is for you to experience their way of life, not to change their way of life to suit yours. 9 13-January-2008 Volunteering Day helping in village school. 10 14-January-2008 Volunteering Continue volunteering. In keeping with their environmental policy, the 3 Rivers resort does its utmost to share the knowledge and explain the benefits of renewable energy sources to guests and locals alike. 3 Rivers runs on all renewable energy. They have a solar electric system and a micro hydro unit installed on the main property, and the forest rooms are powered by a small wind turbine, installed way up in the tree above the canopy near to the tree house. Anyone is welcome to take a tour of the resort, to learn as much as they are able to teach you about the benefits of using renewable energy, and perhaps to teach them a thing or two, in the hope that more people will begin to transfer to greener energy and create a cleaner environment for us all. Dominica is home to a wide range of people. Historically occupied by several native tribes, only a Carib tribe remained by the time European settlers reached the island. French and British settlers each claimed the island, and imported slaves from Africa. 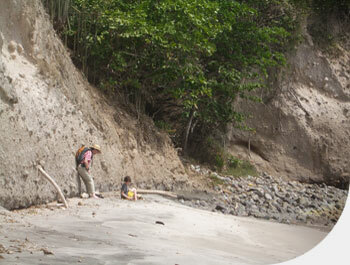 Because of Dominica''''s rugged area, Caribs were able to hide from European forces. Today, on the island''''s east coast, there is a 3,700 acre territory which was granted by Her Majesty Queen Alexandria of Britain and the British Empire in 1903. At first glance, the Carib territory, seems like any other part of Dominica, but this special place has an different feel to the rest of the island. There are only 3000 Caribs remaining after many years of brutal treatment by the Spanish, French and British colonists. It is said that they are the only remaining native Carib people. The Reserve’s inhabitants are descended from the island''''s first settlers, and the majority live in simple homes and generally work the land and the sea. Unlike other Dominicans, who are of African descent, Caribs have South American blood in them, and have a different appearance to the rest of the population, with jet black straight hair, and amazingly beautiful eyes. However, some of them are married with the local Dominicans who originated from Africa. No Carib owns any of the land, rather, the whole territory belongs to them all, and they organize themselves through their tribal council. They elect their own chief. In July of 2003, Caribs Observed 100 Years of Territory. In July of 2004, Charles Williams was elected as Carib Chief. The ancient Carib language is slowly dying out, and is only spoken by very few of the older generation. A ''''Carib Model Village'''' was first suggested by indigenous activists within the Carib Territory of Dominica in the mid 1970s. It was envisaged as a center of indigenous arts and crafts, providing education for the community and for those who visited the Carib Territory. From the late 1970s to the early 1990s the project was considered by various national, regional and international funding bodies, until it was finally realized in 1998 through funding from the Caribbean Development Bank. In 2003, however, the completed project remained unused, falling into disrepair. Currently, the village has been fixed up and now thrives as a center for tourism and fine Carib crafts. The island is a snapshot of the indigenous people and has a large range of diversity shown by the products offered. A visit to the area is an interesting cultural experience; you will see some of the most incredible crafts in the world, including ornate wood carvings and carefully woven wicker baskets ; an ideal place to find some gifts for your friends, ensuring the actual craftsman benefits from the sale, rather than middle men not from the reserve. All the Carib crafts are handmade in Dominica. Learn more about Carib culture and crafts. L''''escalier Tete Chien, a snake-like rock formation protruding into the ocean, and the horseback ridge are amongst the places of interest well worth visiting during your stay in Dominica. L''''escalier de Tête-Chien is the Spectacular volcanic staircase down to the sea. 12 16-January-2008 Free day Optional local guided hikes. Visit beach if desired. 13 17-January-2008 Volunteering A day assisting with eco tourist trail development to local waterfalls and sites of interest. 14 18-January-2008 Project Dedication and Progress Report Return to monitor progress in the village gardens and projects from week one. Participants and community members will reflect on the project and their work together. 15 19-January-2008 Travel home Transportation will be provided to the airport in Roseau.